For me, the Festival Of Plagiarism was a 'success' because it led to a several developments (both theoretical and practical) in that series of interlinked concepts with which I'd been working for several years. The effect this has had on my understanding of 'plagiarism', 'multiple names' and 'art strike/refusal of creativity' can be gleaned (at least partially) from a close reading of the present text. Although I disagreed with much of what Ed Baxter had to say, I found his ideas pertinent to my own pursuit of issues linked to plagiarism &c. Similarly, the discussions I had with John Berndt during the course of the Festival were both frank and stimulating; Berndt's treatment of the censorship issue was particularly memorable and vigorous. On a more mundane level and as I have already stated, I feel that our ability to organise and carry through (without funding) an event as ambitious as the Festival Of Plagiarism was a considerable administrative achievement - something with which Ed Baxter now seems to (at least partially) agree. However, Baxter still feels dissatisfied with the level of debate he experienced during the Festival. In my opinion Baxter's expectations of the event were, from the beginning, unrealistic. His experience may also be explained (at least partially) in terms of personality differences, since a number of people I spoke to were discouraged from engaging Baxter in conversation because of what they saw as his off-hand manner. Likewise, a good deal of the most interesting debate over issues raised by the Festival has actually occurred in the year since it took place. An issue which concerned both Baxter and myself immediately after the Festival was the question of 'coherence'. However, Baxter's claim (in his "A Footnote To The Festival Of Plagiarism", Variant No. 5) that the Festival's organisers presented 'a united front of diverse tastes... to a body of consumers otherwise unable to make sense of the discontinuous and confused manifestations of a supposedly coherent radicalism', is both inaccurate and patronising. With hindsight, it is clear that making the Festival 'coherent' was never a realistic possibility, nor much of an issue. Among other things, Baxter's written statements both before and after the event (i.e. "ReDistribution" and "A Footnote...") warned the potential and actual audience of the fact that the Festival was not so much a 'united front of diverse tastes', as an arena in which various cultural tendencies fought out their theoretical positions. While this may not have been apparent to those individuals who attended only one or two of the events which constituted the Festival, anyone who read the "Plagiarism" booklet and/or visited a variety of the Festival's exhibitions would have been hard pressed to miss the 'in-fighting'. In relation to this, "A Footnote..." is interesting on several counts and gives a fair indication of the (at times) abstract nature of Baxter's approach to cultural issues. Relying chiefly on an analogy with what he sees as the 'cultural condition', Baxter suggests that 'little ground which might have provided a basis for coherent, intelligent and relevant radical-left cultural activity was gained' during the Festival Of Plagiarism. Despite his assertion that it would be pointless 'to mythologize or lapse into an indulgent celebration of the Festival's inadequacies', mythologizing is precisely what Baxter does, since the very thing missing from his recitations of the Festival's 'failures' is any mention of the Festival itself (nothing which occurred under its aegis is described and beyond Baxter and myself there is no indication of who organised or participated in the event! ).7 It is debatable whether or not the moral tags of 'coherent', 'intelligent', and 'relevant' which Baxter attaches to 'radical-left cultural activity' apply to "A Footnote..."; within it Baxter claims the Festival was both 'ignored by the establishment' and 'recuperated by the art world' (and here, in view of the derogatory tone and reference to recuperation, the phrase 'art world' clearly signifies the cultural 'establishment'). To suggest that the Festival was thus both 'ignored' and 'recuperated' is ludicrous since, given the context, these categories are mutually exclusive. However, despite the numerous criticisms I have of Baxter's theoretical position vis-a-vis the Festival, I do not wish to obscure the influence he's had on the development of my thinking. This influence will be readily apparent to anyone who compares the present essay with the text "Plagiarism As Negation In Culture" which I wrote (as Karen Eliot) in February or March '87 (after Graham Harwood had badgered me about incorporating some of his ideas on the media into a written statement that could be handed out as an example of what should be produced in terms of text for his proposed plagiarism paperback). While Baxter feels the Festival was a 'failure', Harwood, like me, considers it to have been a 'success'. Stewart Home, London March 1989. A number of events related to the Festival Of Plagiarism have taken place over the past year. These include "Arrival/Departure" a video installation by Malcolm Dickson at the Third Eye Centre, Glasgow, in March '88; "A Conspiracy Of Feelings" a one-person show by William Clark at Transmission Gallery, Glasgow, in March '88; The Festival Of Non-Participation which was organised in Scotland by Pete Horobin over the summer and autumn of '88; The Festival Of Censorship which was organised in Baltimore by John Berndt in the summer of '88; a one person show entitled "Work" by Graham Harwood at Transmission Gallery, Glasgow, in September '88; and "Refuse" an installation by Glyn Banks, Ed Baxter, Simon Dickason, Denise Hawrysio, Andy Hopton, Hannah Vowles and myself (working as Karen Eliot) which was organised by Simon Dickason and held at Galleriet Laderfabriken, Malmo, Sweden, in October and November '88. This last event was arranged before the Festival Of Plagiarism took place - and it is unlikely that all its participants would have agreed to work together had they been asked to do so in the aftermath of the Festival. The organisers of the San Francisco Festival followed up their first event with a week long "Art Strike Mobilization" in January 1989 (and like their Festival, this was held at Artists Television Access). The Fifth International Festival Of Plagiarism will take place in Glasgow between August 4th and 11th 1989. "Plagiarising Art Trivia", photo-story, Caribbean Times, 15/1/88. "A New Look...", photo-story, Streatham & Lambeth Comet, 22/1/88. "Hoardings Go On Show", photo-story, Streatham & Tooting News, 22/1/88. "All Whose Own Work? ", Jonathon Sale, Punch, 5/2/88. "Festival Of Plagiarism", (cover story) Artists Newsletter, February 1988. "Steal A Little Entertainment", Leslie Goldberg, S.F. Examiner, 5/2/88. "Living On Borrowed Time", John A. Walker, Times Higher Education Supplement, 26/2/88. "Art Imitates Art", Peter Johnston, Prism, March 1988. "City 68/77/88/2000" (Item 3), Jon Savage, Heartbreak Hotel No. 4 July/August 1988 (this article had previously appeared in the Paris based City Magazine - date not known - and was subsequently reprinted in Vague No. 21, January 1989). "A Footnote To The Festival Of Plagiarism", Ed Baxter, Variant No. 5, Summer/Autumn 1988. 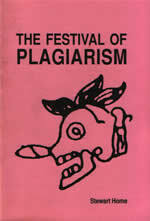 "Festival Of Plagiarism" (review), Jon Winet, Bloatstick, Fall 1988. Extracts from the booklet accompanying the Festival Of Plagiarism ("Plagiarism: art as commodity and strategies for its negation" edited by Stewart Home - first published November '87 by Aporia Press, new edition with two reprints Aporia Press '88) were published in Force Mental No. 15. Reviews of the "Plagiarism" booklet have appeared in "Box Of Water" No. 3 (autumn '88) and Artists Newsletter (November '88). The essay "Plagiarism As Negation In Culture" by Karen Eliot was published in the "Desire In Ruins"
Catalogue (Transmission, Glasgow May '87). "Why Plagiarism?" by Bob Jones was published in Variant 3 (Glasgow Autumn '87). Pieces by Tex Beard (Ed Baxter writing under a pen name) and Stewart Home appeared under the heading "Plagiarism" in the Encyclopaedia section of Edinburgh Review 78/9 (Edinburgh Summer/Autumn '87). These texts were all reprinted in the "Plagiarism" booklet. Also see "Photostatic" No. 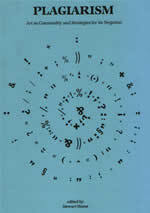 31, a special 'plagiarism issue'; "The Plagiarist Codex: an Old Mayan information hieroglyph" (Xexoxial Editions, Madison '88); "Classical Plagiarism" by Elizabeth Was (Xexoxial Editions, Madison '88); and the small catalogue Baxter, Dickason and Hopton issued to accompany the 'Hoardings' exhibition.